Limestone is a natural stone with a lot of unique character and surface features with each tile being uniquely different from the last. These surface characteristics however can however make a stone very difficult to clean and unless sealed can result in dirt becoming trapped and ingrained. 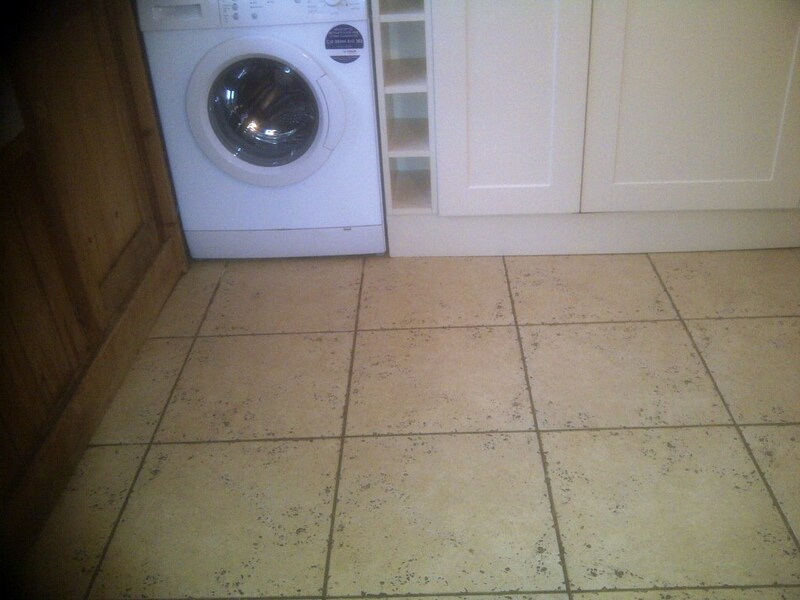 These particular Limestone tiles installed throughout the downstairs floor of a house in Corby are known as Crushed Edge Limestone and have an increased susceptibility to this issue. As you can see from the photographs below the crevices in the tile have become black with trapped dirt which has proved very difficult to clean. Limestone is a very hard surface that has to be burnished with diamond encrusted pads to restore the finish so we set about this task using a set of Tile Doctor Burnishing Pads. Before starting however we soaked the floor in Tile Doctor Pro-Clean and scrubbed this into the tile surface spending particular attention on the grout lines; this process gets a head start on the cleaning and also remove any grit etc. that might cause problems before burnishing. The soiled solution was then rinsed away using water and all was removed using a wet vacuum. The burnishing pads come in a set of four, you start with the coarse pad together with a little water and this cut’s through and removes surface grime and any remaining surface sealer. The resultant slurry is washed away and you then progress through the other finer pads one by one until you get to the final polishing pad which provides a nice shine. 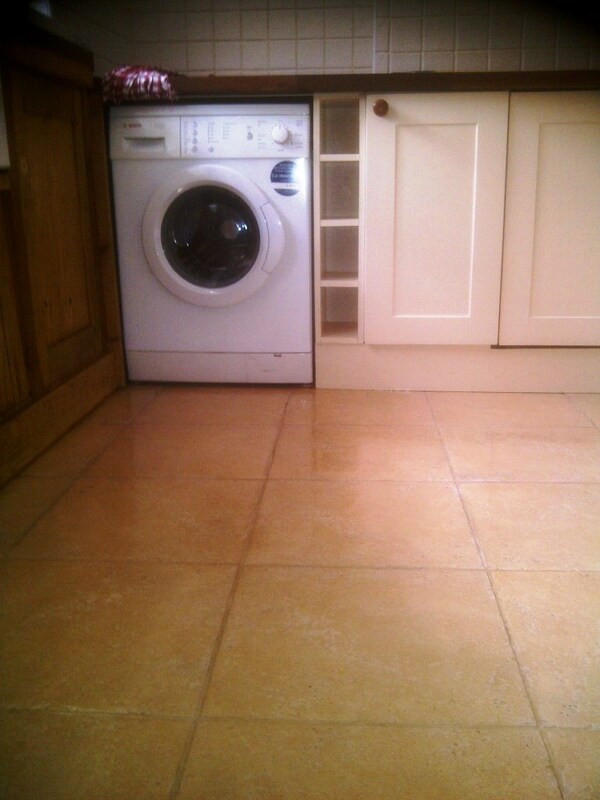 You need to rinse the tiles in-between and use a wet vacuum to remove the slurry. When we came back the next day we tested a few areas for dampness before starting to seal the floor, this is an important step for this type of tile as it can easily trap dirt. We chose Tile Doctor Ultra-Seal for this, it’s a natural look impregnating sealer that occupies the tiny pores in the stone preventing dirt and other contaminates from becoming ingrained, two coats were sufficient. 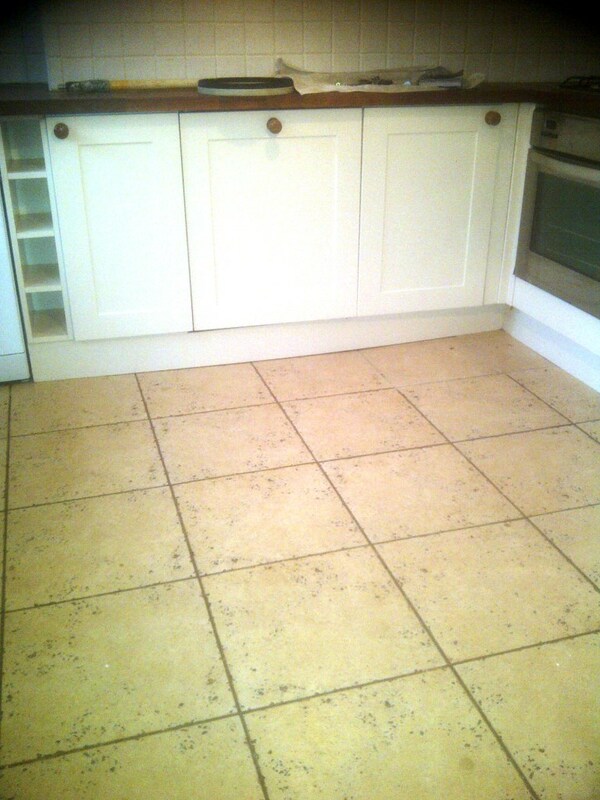 Once the sealer had fully dried we went over it with a white buffing pad to finish. 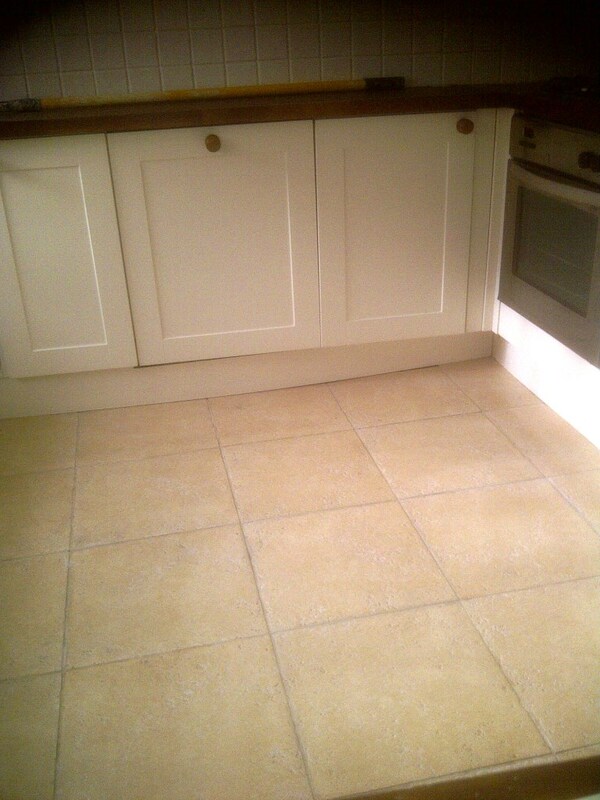 This entry was posted in Work History and tagged cleaning limestone tiles, cleaning services, corby, floor restoration, limestone floor, northamptonshire, sealing limestone floor, tile cleaning, tile maintenance, tiled floor by Philip Vissian. Bookmark the permalink. Your local Tile, Stone and Grout cleaning and maintenance expert covering the country of Northamptonshire. To get a very high shine on Polished Limestone apply Tile Doctor Shine Powder not only does it adds a deeper shine to the stone it also forms a harder surface layer increasing the level of protection.